The effect of microorganisms on immobilization of Cs, Sr, U, and Tc on sandy rocks from upper aquifers was studied. Aquifer water samples taken from observation boreholes in the region of the suspended liquid radioactive waste (LRW) repository, B-2 basin of the Siberian Chemical Combine, were studied in a laboratory, and computer geochemical simulation was performed to estimate the diversity of radionuclide species taking into account the physicochemical conditions in upper aquifers. 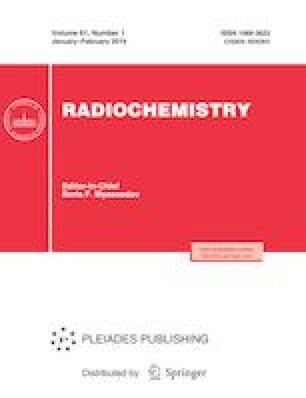 Analysis showed that the activity of microorganisms could affect the reducing conditions in this zone, favoring immobilization of radionuclides with variable oxidation state. Geochemical simulation showed that microbial processes can lead to the formation of U(IV) and Tc(IV) precipitates in a mixture with biogenic sulfide. Fouling of the surface of aquifer rock particles with biofilms reduced the sorption of Cs and Sr but improved the efficiency of the uranium immobilization.